Heavens to Mergatroyd: Yellin' for Yellen! 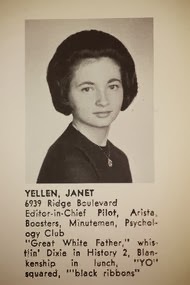 Ms. Yellen, 67, who would be elevated from her current position as the Fed’s vice chairwoman if the Senate confirms her nomination for a four-year term, would be the first woman to lead the Fed. She joined Mr. Obama before the cameras in the State Dining Room of the White House for the formal announcement. With them was the retiring chairman, Ben S. Bernanke, whom the president hailed for helping to guide the economy through the worst recession and financial crisis since the Depression. “I could not be more grateful for his extraordinary service,” Mr. Obama said. As for the woman he has chosen to replace Mr. Bernanke, the president said that Ms. Yellen was “renowned for her good judgment,” and that she sounded early alarms about the financial and housing bubbles that caused the economy’s near-collapse in 2008.